Sie erhalten bei ISPHTTP auch Parallels Confixx Lizenzen zu folgenden Preisen und Konditionen. *) Alle Preise verstehen sich inklusive Mehrwertsteuer von derzeit 19%. Die angegebenen Preise sind Monatsgebühren und für die gesamte Vertragslaufzeit im Voraus fällig. Bitte haben Sie Verständnis, dass die Confixx Preise großen Schwankungen unterliegen und die Preise täglich angefragt werden müssen. Auch dem Endbenutzer stehen eine Vielzahl der Confixx-Funktionen zur Verfügung: Verwalten von E-Mail, Sprachauswahl, Ändern des eigenen Passworts, Verwalten von Subdomains und Domainregeln, Ansehen von Webalizer-Statistiken, Verwalten von MySQL-Datenbanken, passwortgeschützte Verzeichnisse, Verwalten von FTP-Benutzern, Benutzen von Webmail und Web-FTP zum Hochladen/Herunterladen von Dateien. 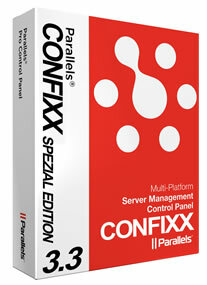 mehr..
Mit dem Confixx Application Pack, dem Add-On der Confixx 3.3 Special Edition, steht Ihnen eine Umfangreiche Auswahl von über 100 Applikationen zur Verfügung. Durch integration in Confixx ist eine Installation der Scripte ohne PHP und MySQL Kenntnisse in sekundenschnelle möglich. Suchen Sie Ihre Lieblingsapplikation nach Namen oder den Gruppen aus, tragen Sie im Installationsfeld den gewünschen Pfad sowie das gewünschte Passwort ein und einige Sekunden Später befindet sich das Programm bereits auf Ihrem Webspace und kann sofort genutzt werden ohne lange und komplizierte Installation im Vorfeld durchführen zu müssen. Mit dem Confixx Application Pack sparen Sie Zeit und Nerven, natürlich geht das Deinstallieren der Software genauso umkompliziert und einfach. Somit können auch Anfänger die keine Erfahrung mit PHP und MySQL haben alle Applikationen in unserer Liste schnell und einfach nutzen. Das 100+ Applicationpack "Auflistung aller Programme"
Alle Versionen werden automatisch bei jedem Application Update aktualsiiert, beachten Sie bitte das diese Liste nur zur Orientierung dient und sich die Versionen sich durch Updates ändern. Die Meisten Anwendungen sind selbstverständlich auch in Deutsch verfügbar. 4images 1.7.10 gallery 4images is a powerful web-based image gallery management system. Features include comment system, user registration and management, password protected administration area with browser-based upload and HTML templates for page layout and design. By using the integrated template system the design and layout can be customized easily. 4images is multilingual: an external language file can be used for translation in other languages. 4images can also be used for other media types like video, audio or PDF. More features are: RSS feeds, search engine, automatic thumbnail generation, extensive user administration, upload function for users, showing IPTC and EXIF data of images, rating of images, spam protection, protection against hotlinking, newsletter function, e-cards, integrated database backup function, etc. AdvancedPoll 2.0.8 Survey software AdvancedPoll is a poll management system. ATutor 1.6.2 misc ATutor is an Open Source Web-based Learning Content Management System (LCMS) designed with accessibility and adaptability in mind. AutoIndex 2.2.4 File Listing AutoIndex is a PHP script that makes a table that lists the files in a directory, and lets users access the files and subdirectories. It includes searching, icons for each file type, an admin panel, uploads, access logging, file descriptions, and more. b2evolution 3.3.3 Blog b2evolution is an advanced weblog tool, i-e software allowing you to run your own blogs, newsfeeds or even photo strea. It's free as free can be! (GNU General Public License). All the features you can expect are included: advanced browsing (paged, calendar, categories, search...); extended and multipaged posts image/file upload and management; multiple and sub-categorie; draft and quick publishing; rss and atom feeds automatic pinging of blog directories; skins / themes; plugins. As you will find out, b2evolution goes beyond most other blog tools. b2evolution is the tool for bloggers who want more! bookstore 1.0 Webshop Online BooksStore is a fully functional online store that you may use as a framework to create an expanded system or use 'as is'. CivicSpace 0.8.5 CMS CivicSpace is a community organizing platform. classifieds 1.0 Misc Online Classifieds is a basic, yet fully functional online classifieds system. Coppermine 1.5.8 Gallery Coppermine Photo Gallery is a picture gallery script. Users can upload pictures with a web browser (thumbnails are created on the fly), rate pictures, add comments and send e-cards. The admins can manage the galleries and batch add pictures that have been uploaded on the server by FTP. Support for multimedia files has been added recently. Images are stored in albums and albums can be grouped by categories. The script supports multiple users and each user can possibly have its own set of albums. The script also supports multiple languages and has a theme system. CPGDragonfly 9.1.2 Dragonfly CMS is a powerful, Open Source content management system. CSLH 2.14.5 Customer support A multi-user, multi-operator, multi-department Live Help support chat system. cubecart 3.0.20 webshop CubeCart is an eCommerce script written with PHP and MySQL. cutenews 1.4.6 ute news is a powerful and easy to use news management system that uses flat files to store its database. dotproject 2.1.2 Misc BSD-licensed PHP-MySQL web-based project management application, with Gantt chart support. Drupal 7.12 none Drupal is an open source content management system which supports pluggable modules which enable additional behaviors. The modules available for Drupal provide a wide assortment of features, including e-commerce systems, photo galleries, mailing list management, and CVS integration. e107 0.7.20 CMS e107 is a content management system written in PHP and using the popular open source MySQL database system for content storage. It's completely free, totally customisable and in constant development. eGroupWare 1.6.002 Groupware EGroupware is a enterprise ready groupware software for your network. It enables you to manage contacts, appointments, todos and many more for your whole business. Events 1.0 Misc Events is a basic, online Event management system. formmail 1.92 Form Mailer FormMail is a universal WWW form to E-mail gateway. gallery 3.0.2 Gallery Gallery 3 is the newest addition to the Gallery Project's portfolio of intuitive photo, video and audio sharing web application solutions. Upon its launch in the Fall of 2010, Gallery 3 offers more control, better uploading and enhanced performance. Its design is based on the the feedback provided by the Gallery Community of Users at large. Serving millions, Gallery is the most widely used system of its kind. geeklog 1.4.1 Misc Geeklog is a weblog powered by PHP and MySQL. It allows you within minutes to set up a fully functioning dynamic website, and has many features to get you started. guestbook 2.4.3 Guestbook PHP-based guestbook script. HelpCenterLive 2.1.5 Customer support Help Center Live is a `Live` help desk system that features Live Support, Trouble Tickets and FAQ within tne project. iPeiGuestBook 2.0 Guestbook iPei is a simple and elegant guestbook with spam-protection. Joomla 2.5.3 CMS Joomla! is a powerful open source content management system. It is used for managing simple Web sites and complex corporate applications. Joomla! is easy to install, simple to manage, and reliable. Once Joomla! is installed and running, it is simple for even non-technical users to add or edit content, update images, and to manage critical data. Anybody with basic word processing skills can easily learn to manage a Joomla! site. knowledgetree 3.4.5 Document mgmt. KnowledgeTree is the leading commercial open source electronic document management software designed for teams and small to medium-sized organizations. With no vendor lock-in and with source code readily available, KnowledgeTree provides a more flexible, cost-effective alternative to proprietary applications. kplaylist 1.7.426 misc A music database that you manage via the web. With kPlaylist you can stream your music (ogg, mp3, wav, wma, etc. ), you can upload, make playlists, share, search, download and a lot more. LifeType 1.2.4 Blog LifeType is an open-source blogging platform. Links 1.0 Misc Events is a basic, online Event management system. mambo 4.6.5 CMS Mambo is a free popular Content Management System (CMS). mediawiki 1.15.2 wiki MediaWiki is a Web-based wiki software application deployed by companies as an internal knowledge management solution, and as a content management system. MediaWiki is written in PHP, and can use either the MySQL or PostgreSQL relational database management system. MediaWiki supports more than 70 languages; it is scalable and customizable. MovableType 3.17 CMS Web based publishing platform for creating weblogs or news pages. myBloggie 2.1.6 Blog myBloggie is considered one of the most simple, user-friendliest yet packed with features Weblog system available to date. nucleus 3.33 CMS A PHP/SQL blogging tool which resides on your webserver. Includes multiple weblog capabilities, and RSS syndication. ODFaq 2.1.0 FAQ PHP application that allows you to manage frequently asked questions. openbiblio 0.5 Bibliotheksystem OpenBiblio is a nice and powerful web library. osCommerce 2.2rc2a Webshop osCommerce is an online shop e-commerce solution. Its feature packed out-of-the-box installation allows store owners to setup, run and maintain their online stores with minimum effort. Owl 0.80 Document mgmt. OWL is a multi-user document repository or knowledge based system. paFileDB 3.6 Document mgmt. paFileDB is designed to allow webmasters have a database of files for download on their site. phpAdsNew 2.0.11-pr1 Misc With phpAds you can easily rotate paid banners and your own in-house advertisements. You can even integrate banners from third party advertising companies. phpBB 3.0.8 phpBB3 is the latest installment in a seven year long package lineup. Like its predecessors, phpBB3 is feature-rich, user-friendly, and fully supported by the phpBB Team. phpBB3 greatly improves on what made phpBB2 popular, and adds commonly requested features that were not present in previous versions. We hope it exceeds your expectations. phpBBAuction 1.3 Auction software phpbb-Auction is a free auction-system which can be used as an add-on for the phpBB-community-software. phpBugTracker 1.19 misc Thanks for taking a look at phpBugTracker. This project was started out of the frustation I experienced getting Bugzilla installed and operational for a web development project. The goals of this project are to produce a web-based bug tracker with functionality similar to bugzilla that is abstracted from the database backend and uses templates for rendering the pages. Currently phpBugTracker is nowhere near a drop-in replacement for Bugzilla, so don't expect it to be. Maybe it will get to that point one day, maybe it won't, but either way I'm trying to make it a capable bug tracker. I hope you enjoy using phpBugTracker, and that you find it useful. phpDig 1.8.8 Search Engine phpDig is simple search engine for your site. phpdocumentor 1.4.1 misc phpDocumentor is the world standard auto-documentation tool for PHP. Written in PHP, phpDocumentor can be used directly from the command-line, or through an easy to use web interface. phpDocumentor can be used to generate professional documentation directly from the source code of your PHP project. Support for linking between documentation, automatic class inheritance and generation of highlighted source code with cross-referencing to php general documentation are just a few of the features of phpDocumentor. phpDocumentor uses an extensive templating system to change your source code comments into human readable, and hence useful, formats. This system allows the creation of easy to read documentation in 15 different pre-designed HTML versions, PDF format, Windows Helpfile CHM format, and in Docbook XML. You can also create your own HTML template to match the look and feel of your project. phpDocumentor can also help with end user manuals, tutorials, and other types of non-programmer documentation that can optionally interact with your inline source comments and vice versa. phpList 2.10.5 Personalised mailing list manager. phpMoney 2.0 Misc PhpMoney is a tool to manage bank accounts through a web interface. phpMyFAQ 2.0.6 It supports various databases to store all data. phpMyFAQ also offers a multi-language Content Management-System with a WYSIWYG editor and an Image Manager, flexible multi-user support with user and group based permissions on categories and records, a wiki-like revision feature, a news system, user-tracking, language modules, enhanced automatic content negotiation, templates, extensive XML-support, PDF-support, a backup-system, a dynamic sitemap, related articles, tagging, RSS feeds, built-in spam protection systems and LDAP support. phpnuke 8.0 Misc Web Portal System. PHProjekt 5.2 Misc PHProjekt is a modular application for the coordination of group activities and sharing information and documents through the Web. PHProjekt provides the following features: group calendar; project management tools; file management; contact manager; e-mail client; built-in HTML editor; Wiki; forum; export of documents to CSV, XLS, Doc, PDF, XML, RTF; synchronisation with Microsoft Outlook and PDAs; support for 38 languages; support for protocols like LDAP, XML/SOAP, WebDAV; support for 9 types of databases. phpSupportTickets 2.2 Customer support PHP Support Ticket is webbased tool to manage requests from customers. phpsurveyor 1.0 Survey software PHP Surveyor is a set of PHP scripts aimed at allowing people to develop online Surveys. phpwcms 1.2.3 CMS Web content Management System. phpwebsite 0.10.2 CMS Complete web site content management system. phpwhois 4.1.2 misc If you are a PHP coder, you can use these classes to incorporate whois lookup functionality into your websites. phpWiki 1.2.11 Wiki A WikiWikiWeb is a site where everyone can collaborate on the content. piwik 1.1.1 misc Piwik is a downloadable, open source (GPL licensed) web analytics software program. It provides you with detailed real time reports on your websit visitors: the search engines and keywords they used, the language they speak, your popular pages and so much more. pLog 1.0 Blog Blogging platform built with PHP, designed with maximum customizability, speed and ease of use in mind. pmachinefree 2.4 Misc Machine is online publishing's most flexible and creative software. PostNuke 0.764 CMS PostNuke is a significant CMS system. punBB 1.2.15 Forum punBB is a PHP powered discussion board. sendcard 3.4.1 Postcards Sendcard is a multi-database (It currently supports 9 different databases!) ecards script or virtual postcard program written in PHP. Suitable for large or small sites, it is very easy to setup, and comes with an installation wizard. Serendipity 1.5b blog Serendipity - a PHP Weblog and Blog software. Serendipity is a PHP-powered weblog application which gives the user an easy way to maintain an online diary, weblog or even a complete homepage. While the default package is designed for the casual blogger, Serendipity offers a flexible, expandable and easy-to-use framework with the power for professional applications. Siteframe 3.2.2 CMS Siteframe is a lightweight content-management system designed for the rapid deployment of community-based websites. SMF 1.1.11 SMF is an online forum based on PHP and MySQL. It provides the following features: advanced permission and user management; multiple languages; multi-media output (XHTML, XML, RSS, WAP); tracking of new and old unread topics; maintenance mode, allowing only admins to login; word censoring, either full word or partial; ability to trace user actions; tracking of topics, messages, new members, and hits per day; ability to send a topic to a friend; ability to view a "printer-friendly" version of topics; banning of members based on their username, email address, IP address or hostname (with banning expiration time). squirrelmail 1.4.21 Webmail SquirrelMail has all the functionality you would want from an email client, including strong MIME support, address books, and folder manipulation. SupportLogic 1.2 Customer support Support Ticket system. textpattern 4.0.6 A flexible, elegant and easy-to-use content management system. Textpattern is both free and open source. TUTOS 1.9.2 Groupware TUTOS is a tool to manage the organizational needs of small groups, teams, departments. typo 4.5.3 CMS TYPO3 is developed by the Danish programmer Kasper Skaarhoej. It is the most advanced GPL Content Management Framework available, and competes very successfully with commercial products costing US $50.000. TYPO3 is distributed under the GPL license, however Kasper has expressed certain aims for the system which we ask you to respect (see typo3.com for more information). UebiMiau 2.7.8 Webmail UebiMiau is a web-interface to your mail. VanillaForum 1.1.2 Forum Vanilla is an open-source, standards-compliant, multi-lingual, fully extensible discussion forum for the web. videodb 3.0.1 Misc VideoDB is a database to manage your personal video collection. It's mainly designed for videofiles but you can also put your DVDs and VHS tapes in it. wbbook 1.1 Guestbook Free guestbook. WebCalendar 1.2.0 Calendar WebCalendar is a Web-based calendaring and scheduling system for managing personal, group and corporate events over the Internet. It is a full featured online application that allows to keep track of personal appointments, group projects, company meetings and resources reservations. It is a reliable, platform independent, real-time scheduling solution for small-to-medium sized organizations, providing a centralized source for all scheduling needs. WebCalendar supports a rich set of business class features, including proprietary features like corporate calendar and calendar dependency. It includes a calendar server, an email reminder system, a task manager, a diary system, a contact list manager and a notes manager. WebShopmanager 2.0 Webshop The Web Shop Manager allows you to manage a fully functional online store from a centralized web-based administration system. Wordpress 3.3.1 blog WordPress is a state-of-the-art semantic personal publishing platform with a focus on aesthetics, web standards, and usability. What a mouthful. WordPress is both free and priceless at the same time. More simply, WordPress is what you use when you want to work with your blogging software, not fight it. xaraya 1.1.4 CMS Xaraya is a cutting edge open source framework (written in PHP) on which developers can create sophisticated web applications and designers enjoy considerable flexibility. xmb 1.9.10 XMB is short for eXtreme Message Board and is an open source forum system written in the PHP 4 scripting language and using the database management system MySQL to store dynamic content. xrms 1.99.2 CRM XRMS is a web-based application for managing business entities such as employees, customers, contacts, activities with those contacts, etc. zencart 1.3.8a webshop Zen Cart is a PHP e-commerce shopping program. Built on a foundation of OScommerce GPL code, it provides an easy-to-setup and run online store. Developed by people who make a living from selling online and who understand what the merchant really needs.